Interested in sharing your love of Bonita Bill’s with your friends, family or favorite foodie? 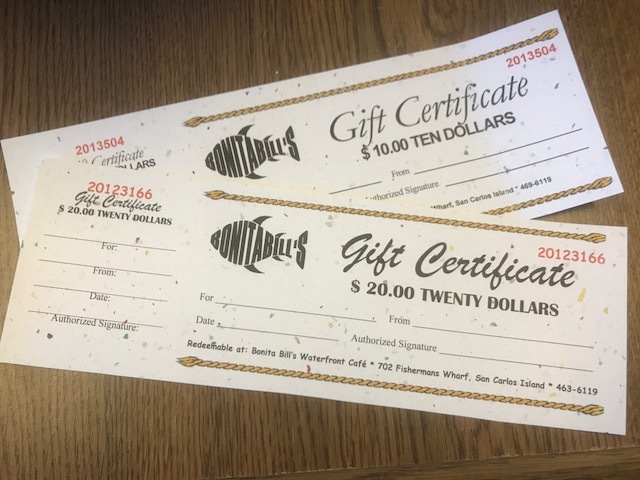 Bonita Bill’s Waterfront Café Gift Certificates are available! 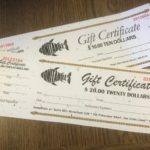 Gift Certificates are available in denominations of $10s and $20s. Not Local? If you are not in the area but would like to purchase Bonita Bill’s Gift Certificates, feel free to send your request to the address listed above Attn: Bonita Bill’s Gift Certificates, indicating the denomination you would like, address of where you would like the gift certificates sent, and your cash or check payment. Turnaround time from receipt of request and payment is 24 hours. Any questions, please contact us at (239) 463-2588.